Received 4 June 2010; revised 15 July 2010; accepted 18 July 2010. 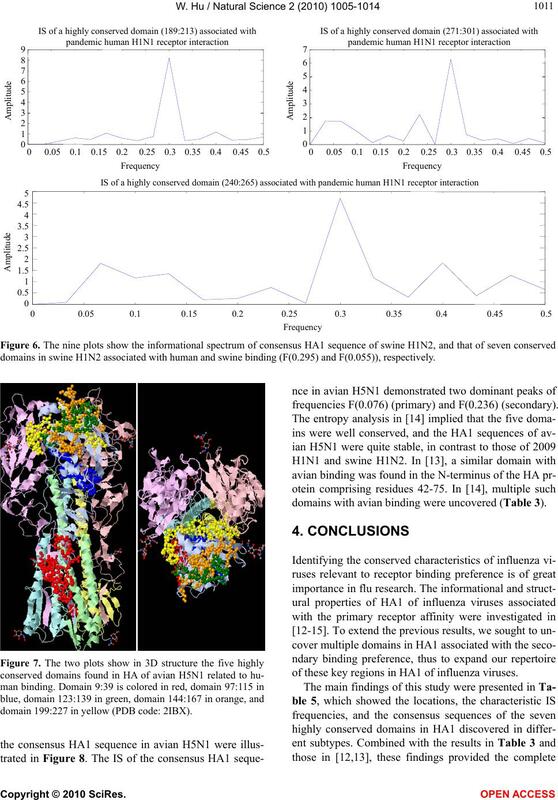 2009 remains a global health concern in 2010.
the distinct dual binding nature of these viruses. rate microarray analysis in . focused on HA and the interaction between HA and NA. 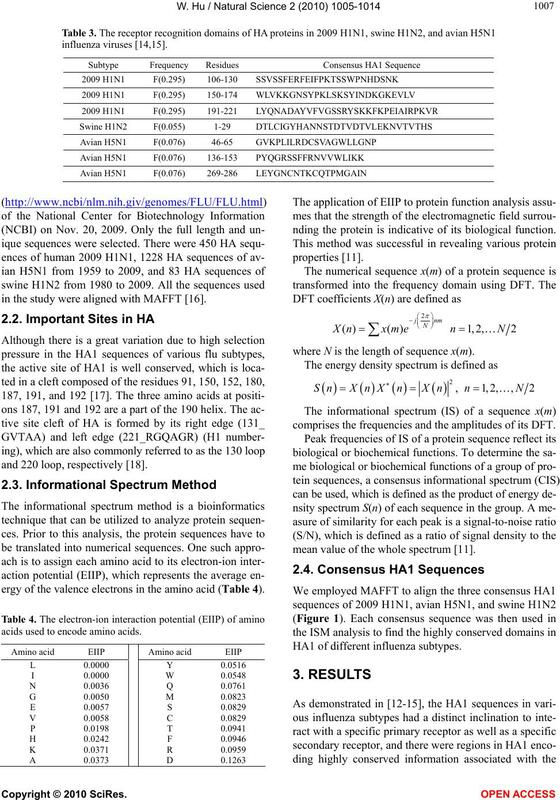 tions on the five epitope regions on H1 were identified. 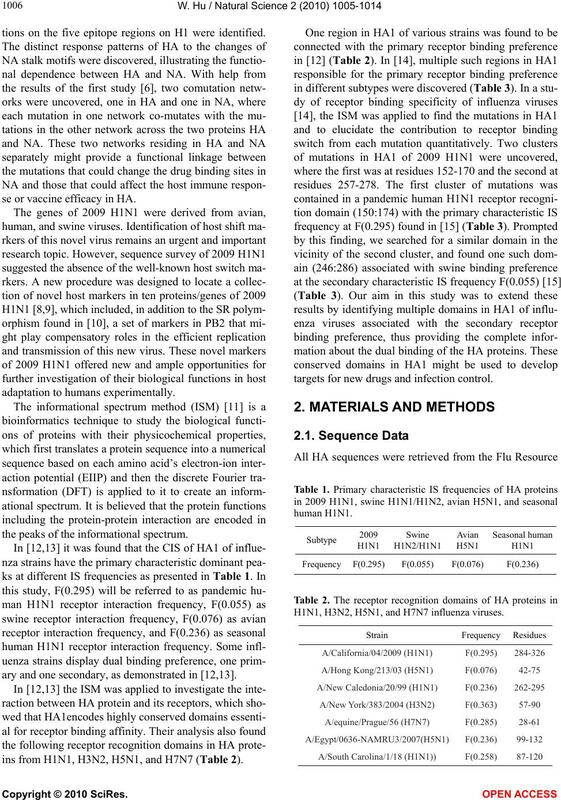 se or vaccine efficacy in HA. the peaks of the informational spectrum. ary and one secondary, as demonstrated in [12,13]. 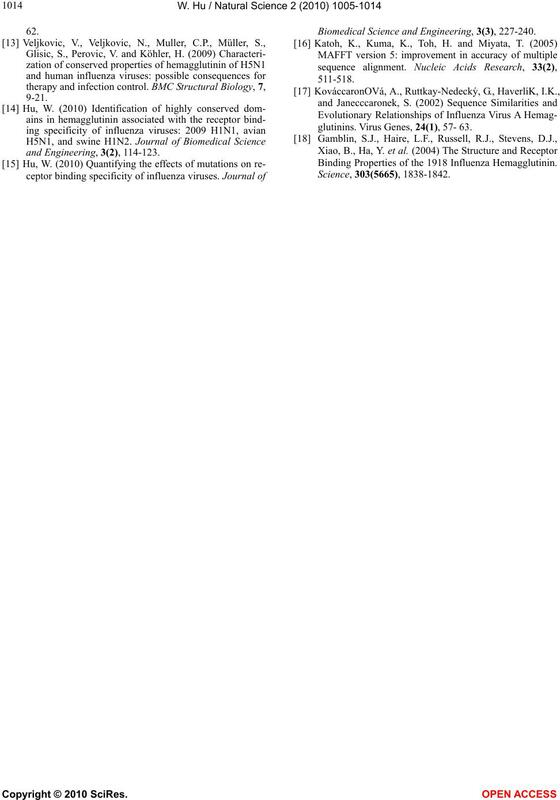 ins from H1N1, H3N2, H5N1, and H7N7 (Table 2). targets for new drugs and infection control. 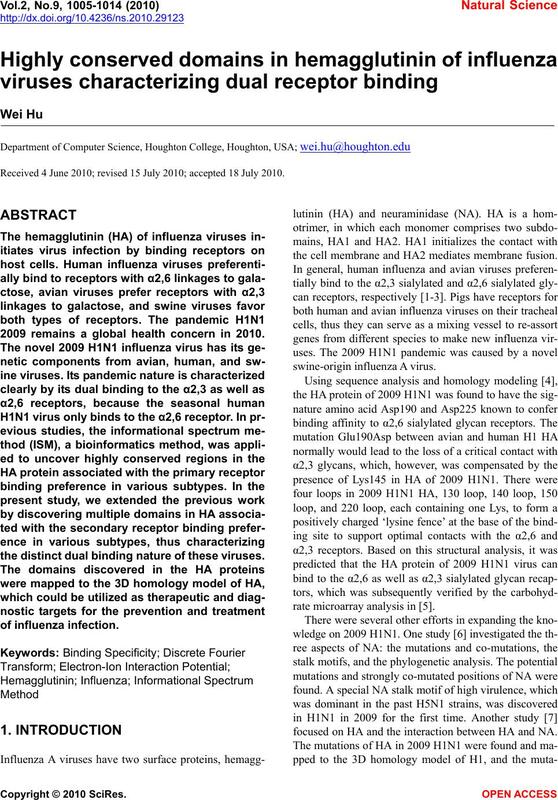 H1N1, H3N2, H5N1, and H7N7 influenza viruses. in the study were aligned with MAFFT . and 220 loop, respectively . acids used to encode amino acids. nding the protein is indicative of its biological function. where N is the length of sequence x(m). mean value of the whole spectrum . ored in red, the left and right edges of the binding cleft in blue. the single strain approach used in [12,13]. and domain 277:287 in gray (PDB code: 1RU7). characteristic was found in  (Table 1). 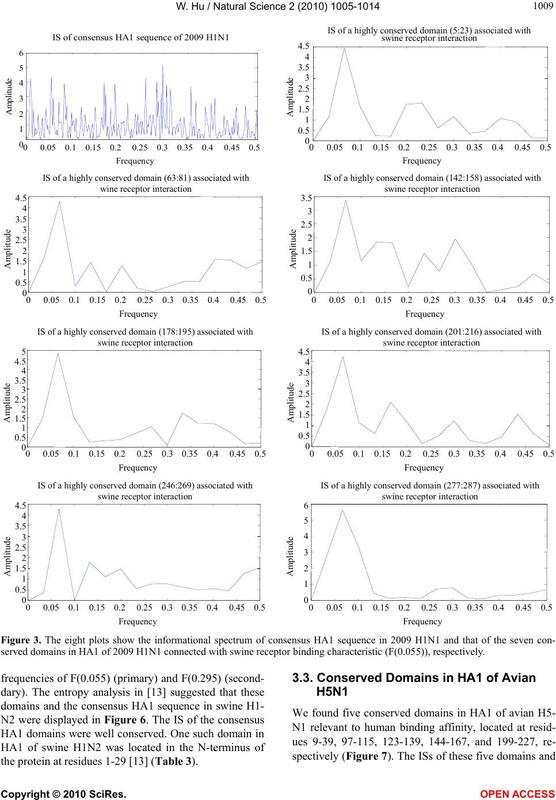 served domains in HA1 of 2009 H1N1 connected with swine receptor binding characteristic (F(0.055)), respectively. the protein at residues 1-29  (Table 3). in green, and domain 277:287 in orange. in orange, and domain 271:301 in yellow. domains in swine H1N2 associated with human and swine binding (F(0.295) and F(0.055)), respectively. domain 199:227 in yellow (PDB code: 2IBX). frequencies F(0.076) (primary) and F(0.236) (secondary). domains with avian binding were uncovered (Table 3). of these key regions in HA1 of influenza viruses. 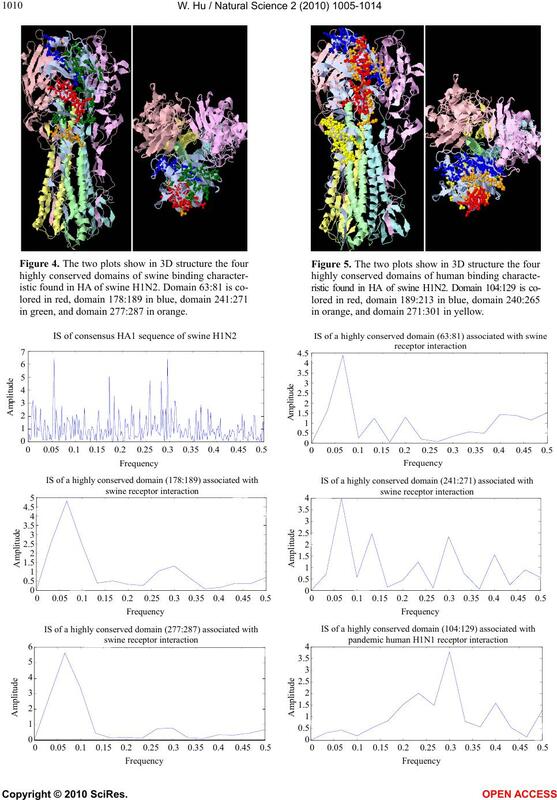 trum of the six conserved domains in avian H5N1 associated with human binding (F(0.236)), respectively. might modulate the dual receptor binding preference. in a given subtype than those obtained in [12,13]. A (H5) viruses. Virology, 344(2), 432-438.
tional Biology and Chemistry, 32(3), 198-211.
fluenza virus. Nature Biotechnology, 27(6), 510-513.
ray. 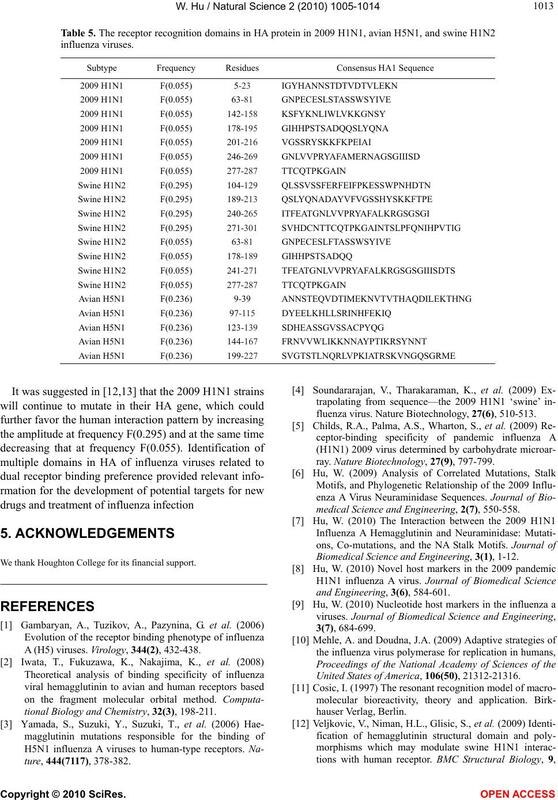 Nature Biotechnology, 27(9), 797-799.
medical Science and Engineering, 2(7), 550-558. Biomedical Science and Engineering, 3(1), 1-12. United States of America, 106(50), 21312-21316. Biomedical Science and Engineering, 3(3), 227-240.
glutinins. Virus Genes, 24(1), 57- 63.